In what has become a tradition, Steve’s Jewellery has once again put up pieces of Guyana’s gold for the Most Valuable Players of the various categories at Guyana Softball Cup 8, set for this weekend. 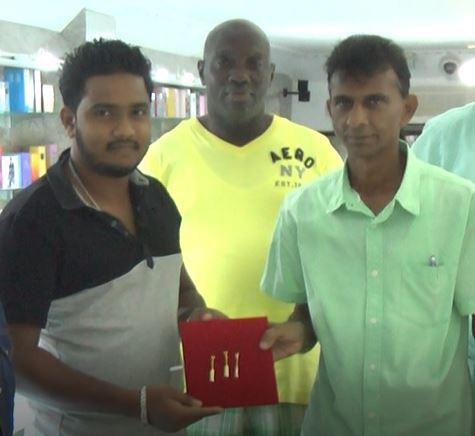 The Church Street business establishment presented three gold pendants in the shape of a cricket bat to representatives of the Guyana Floodlights Softball Cricket Association, the organising body of the three-day tournament. The pendants are accentuated with diamond studs. A pendant each will be presented to the Most Valuable Player of the Open, Over-45 and Over-50 categories. Steve’s Jewellery’s representative, Mitchell Perreira, said the company is enthused to once again being afforded the opportunity to be part of the biggest softball competition in Guyana. Dharam Persaud of the Guyana Floodlights Softball Cricket Association was thankful for continued sponsorship of the MVP prizes by Steve Naraine, the proprietor of Steve’s Jewellery. He related that such rewards are an added incentive for players to strive for excellence on the field. 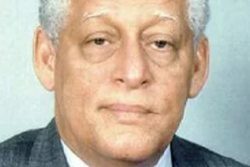 Teams from Guyana, New York, Canada and Florida will converge in Guyana on the weekend of October 26-28 to compete for softball supremacy in the Americas. 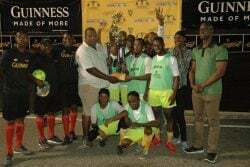 Once again, the Guyana Floodlights Softball Cricket Association is promising an action-packed and competitive tournament. 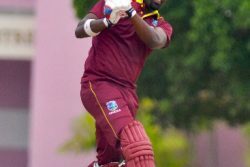 The category finals would be on Sunday at the Demerara Cricket Club, starting at 10:00h and concluding with the Open final under floodlights.